getSmartcoders has over 10 years of experience in test automation services for varied technologies across equally varied industry verticals. Over the years we have gained extensive exposure to help you identify the right test case for automation and select the right set of test automation tools and frameworks to guarantee best ROI. Automation in software testing is one of the most efficient ways to release new software updates to users or launch new apps. It helps the businesses to leverage new business opportunities that open for only a short window. Test automation allows the test cases to be reused across various functionalities such as different browsers and devices, thereby increasing the scope of coverage, while keeping the costs and time in check. To ensure that automation testing tools are being leveraged in the best possible manner, you need to outsource automation testing strategy to a reliable partner. Did you know that an alarmingly high number of projects fail to meet the client objectives or suffer significant losses and delays due to defects being discovered much later in the process? Test automation is complex, but only for an inexperienced outsource vendor. Allowing these defects to leak into processes can lead to poor ROI and reduced customer satisfaction with your product or service. However, by using quality automation testing tools, these problems can be effectively addressed and help remove inconsistencies from your business process. Reliable test automation companies will not only focus on building automation scripts, but also provide turnkey test automation solutions that assures clients of high quality software. We have profound expertise in all major automation testing tools including open source test automation tools and libraries. We blend our knowledge, advanced skills and experience to deliver quality automation faster and better. We understand that our clients have strict delivery schedules that must always be fulfilled. Products or services that are delayed can lose customers and revenue. But our automated testing solutions are deadline driven. All our developers are trained to work in tight schedules and still deliver their utmost performance. We also understand that our clients are under constant pressure to stay within their testing budgets, all this while involving more resources to deliver their services to the market in timely manner. However, GetSmartCoders can take that worry off your hands by being your outsourced automation testing company. We employ the best automation testing tools and only work with competent experts that helps you cut down costs and free up your valuable resources for other value-added tasks. Our automation testing tools help identify bugs and errors before the final release. This ensures that the final app delivered in the market is free of any defects and geared towards providing excellent performance. GetSmartCoders is an automation testing company that offers competitive advantage by allowing its clients to reallocate their savings towards other business activities. Our turnkey automation testing framework uses multiple app platforms to ensure that cost of investment is low and return on investment is high. We make this possible by providing well defined framework that is robust and scalable. Once our client confirms their test requirements, we can start the automation testing process simultaneously with planning of manual test cases. We use the most sophisticated automated software testing tools that allows us to reduce the development cost by empowering our manual testers and clients to create test scripts automatically. Mobile automation testing tools and automated web testing are geared towards detecting potential errors and blocking defects in the software. With the help of our software automation testing coupled with experienced professionals, our clients can leverage expert tools and proven processes designed for success. At the same time, we are a test automation services company that can provide turnkey automation deployment, allowing the processes to accelerate and make it consistent. We guarantee affordable services and reduction of operational costs and We follow tight processes, allowing us to detect problems in the early stages of testing. Our senior automation testers come with a degree in computer science or related field. We look for candidates with at least 5 years of experience in handling automated technology tools, troubleshooting, systems testing and programming. While these forms the corner stone of our hiring strategy, we also give due weightage to their skills in test architecture, test design, configuration management, troubleshooting, ability to think analytically etc. Entry-level positions are open for fresher who make a beginning under senior testers. GetSmartCoders is a reputed outsource test automation service company that follows a methodical, ROI intrinsic and cost-effective test automation process. We also involve our experienced QA team from get-go to perform initial requirement analysis and continue working with the development team until the project concludes. Next phase is to perform thorough analysis and define automation testing tools required for the project. We also evaluate the existing manual processes in this stage. We asses and develop the framework. We also prepare scripts to perform testing. We deploy the automation framework and fine tune our test automation process along the way. We capture, review and analyze results for reporting purposes. We identify pass/fail scenarios for test cases and provide automated testing review summary to the client. When you outsource automated software testing requirements to GetSmartCoders, you not only get unparalleled service standards, but also the benefit of robust automated software testing tools. We help you save money and time by keeping our processes simple, yet effective. 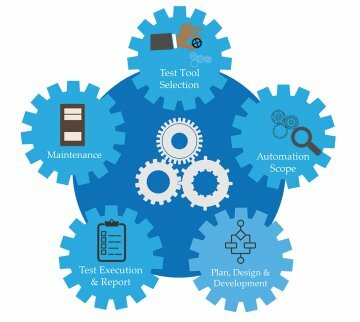 Our software test automation services can take testing and quality check jobs off your hands and free up your specialized teams for other intrinsic tasks. It is important for our clients to know that test automation solution cannot be same for everyone. It requires serious customization and making the right choices of mobile automation testing tools or automated web testing based on client requirements. Looking for a reliable offshore automated software testing company? Outsource automation software testing services to GetSmartcoders to begin the discovery process.